Carpets have become a popular flooring option for not just homeowners but restaurants and offices as well. An inexpensive flooring option – carpets are installed in different fabrics that promote both practicality and aesthetics. This floor furnishing is easier to install than wooden or marble flooring and helps decrease noise. Yet it takes more effort to clean a carpet as compared to a wood floor. You cannot simply mop up spills from a carpet, nor mask odor and mildew from fabric strands. Taking care of health and hygiene can also become difficult – seeing harsh chemicals are usually used to clean carpets. Green Carpet Cleaning To the Rescue! This process utilizes effectiveness of specially formulated cleaning solutions and technology, promoting environment-friendly qualities and safety. Green carpet cleaning is an eco-friendly alternative for chemical cleaning solutions which provide the same (if not better) results. According to various studies, unclean workplaces promote detrimental effects on the physical health and mental state of people working in that environment. Unclean workplaces can host a slew of harmful germs and bacteria, which can be spread easily by employees. At the office, carpets harbor bacteria and mildew in addition to the chemicals left from conventional cleaning. This can lead to respiratory issues and allergy! 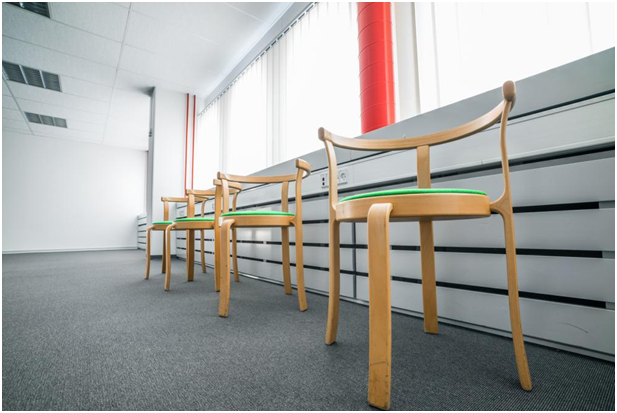 It is also a very good idea to appoint a green carpet cleaning service for your office, especially if the building doesn’t have any windows for proper air ventilation. Stains happen. It doesn’t matter if you are eating at your desk or drinking that all-important mug of coffee. You will spill something on the carpet, foregoing the cleaning-up part. Dried and set stains are difficult to remove and make any space look ugly! A green cleaning service will not only clean your office’s carpet but wipe the windows, spot clean the upholstery, and sanitize your desk and other surfaces. There is a general misconception prevalent about green cleaning methods regarding effectiveness of cleaning. People believe green cleaning cannot provide the same intensity chemicals offer when it comes to cleaning thoroughly. This isn’t true. Green cleaning solutions and processes are mild in nature yet offer fantastic benefits in cleaning. More importantly, they don’t have side effects of chemical based cleaning solutions, as green cleaning takes the power of nature and natural sources. Moreover, better and more powerful technology is utilized with green cleaning. For instance steam technology can be used to disinfect spaces using nothing but pure H20. Are you hiring a carpet cleaning service in Bakersfield to help maintain your carpets? Excellence Janitorial Services & Carpet Cleaning offers fantastic green cleaning options!